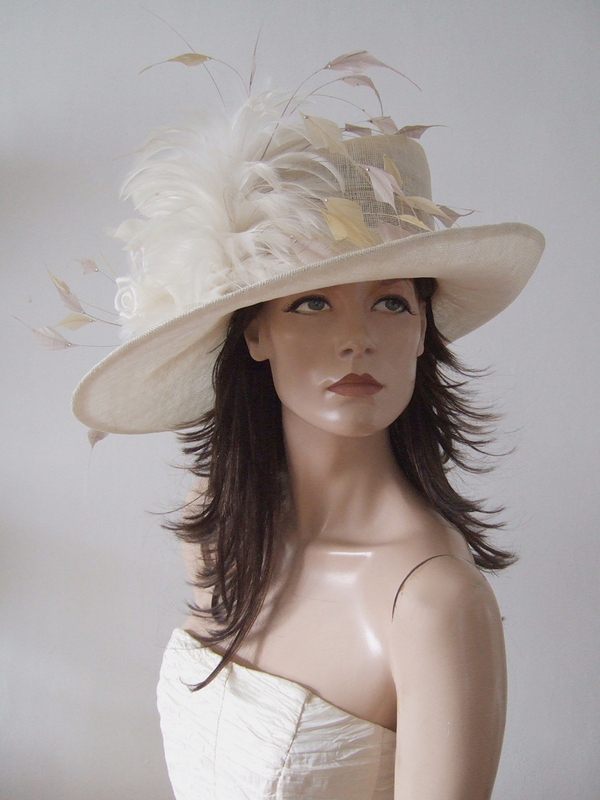 Two Tone Ivory Cream Down Sweep Hat with a huge feather arrangment with Ivory Hackle, and Cream and Latte trimmed coque dotted with Swarovski crystals. Bedded behind the feather arrangement are two Ivory Silk Roses, and a bow of Ivory Veiling. This hats brim has a modern down sweep, falling lower over the right hand side of the face. Crown has a 22.5" inner circumference. Brim is 6.75" wide on right side, 4" Wide the left hand side. Crown is 4.75" High on the tall side, and 3.5" on the right side.